"The Sri Lankan army suffered another serious military debacle in the war for the liberation of Jaffna peninsula as Chavakachcheri town, the capital of Thenmarachchi division, fell to the armed forces of the Liberation Tigers of Tamil Eelam (LTTE). This strategically important town situated in the heart of the Jaffna peninsula came under the control of the Tamil Tigers after 12 hours of ferocious fighting. "Columns of heavily armed commandos of the Tamil Tigers supported by artillery and mortar fire launched a multi-pronged attack on the Chavakachcheri town in the early hours of the morning today. Intense fighting continued through the day. Unable to sustain the power and fury of the Tiger assault the resistance of the government troops collapsed late in the evening around 6p.m culminating in a chaotic withdrawal. Defeated and demoralised, the troops are fleeing toward Kodigamam town, the last defence position of the Sri Lankan army in the Thenmarachchi sector. "In the bloody battle of Chavakachcheri the Sri Lankan army suffered heavy casualties. Dead bodies of soldiers are scattered all over the town area. The LTTE fighters have also recovered a huge quantity of arms and ammunition. "In the heavy fighting that continue yesterday and last night, the combat formations of the LTTE overran military bases at Maduvil, Nunavil and Sarasalai junction and brought under their control vast tracts of territory in the Chavakachcheri sector. 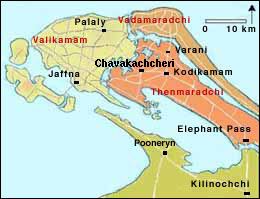 With the fall of Chavakachcheri town and its surrounding villages to the Liberation Tigers, Kodigamam town stands as the last bastion in the Thenmarachchi division of the peninsula for the fleeing Sri Lankan army. "Taking cover under the iron curtain of draconian censorship laws, the Sri Lankan Defence Ministry has been shamelessly denying all the humiliating military defeats and heavy casualties suffered by the Sri Lankan army during this week and has been propagating false and distorted versions of war news to the world media."